Guindos: "Nobody believed the figures, it was vital to avoid the collapse of the sector and the complete rescue of Spain"
The vice president of the European Central Bank, Luis de Guindos, has defended his action in the Bankia case in 2012 , because it was "the most problematic case" and "it was vital for the Government the collapse of the financial sector and the complete rescue of Spain". The former Minister of Economy, who testifies by videoconference from Frankfurt at the National Court, has assured that when the Executive of Rajoy came to power "Spain was the main risk to the economy of the Euro Zone as a result of the situation of the banking system" and that "the State with a deficit of more than 9% could not rescue". 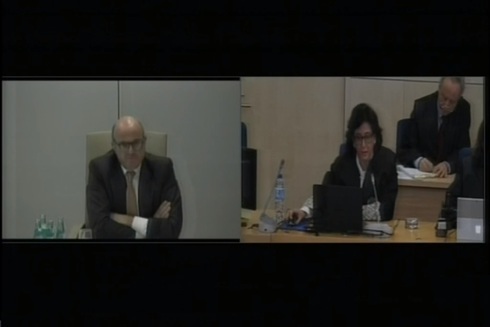 To questions from the prosecutor, Carmen Launa, Guindos has ensured that the IMF caught his attention in February 2012 on the situation of Bankia and the boxes in general and that the first decree of those dates, which called for a sanitation of 50,000 million , "could not be enough". He also recalled that the then President of the European Council, Hermann Van Rompuy, called Mariano Rajoy at that time and asked him to name "an independent evaluator" of the accounts of the Spanish banking system, because "nobody believed the figures" in a touched sector in which the main exponent was Bankia. He has assured that he found out that the entity chaired by Rodrigo Rato could not present accounts with an audit report when he informed the National Securities Market Commission. He has denied that he was previously informed by the Bank of Spain or the auditor Deloitte. The then governor of the Bank of Spain, Miguel Ángel Fernández Ordóñez, told him that Rodrigo Rato could be kept and that "with appointing a new CEO was enough", according to the version of Guindos. As for Rato, he told him in April that he had failed a merger plan with Unicaja and Liberbank and did not tell him that he planned to change his CEO.